Daryl Hall & John Oates, known more commonly as Hall & Oates, are an American musical duo from Philadelphia. 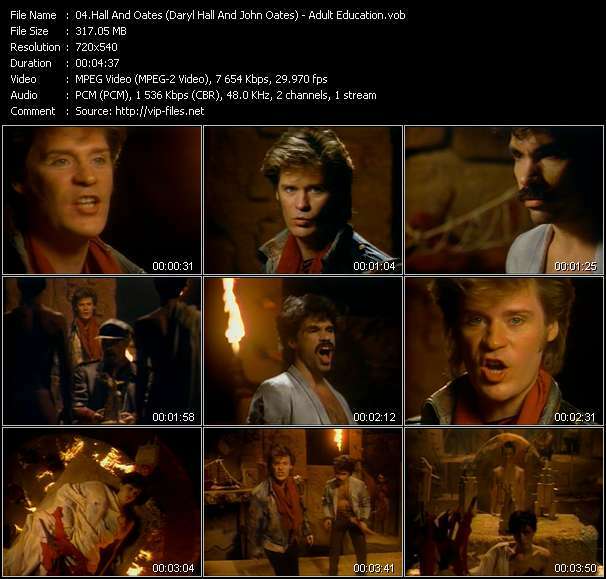 Daryl Hall is generally the lead vocalist of the pairing, and also plays a wide range of musical instruments. John Oates also plays a range of instruments, but primarily plays electric guitar and provides backing vocals as well as occasional leads. The two also write most of the songs they perform, either separately or in collaboration. They achieved their greatest fame from the late 1970s to the mid-1980s with a fusion of rock and roll and rhythm and blues, which they dubbed "rock and soul." Critics Stephen Thomas Erlewine and J. Scott McClintock write, "at their best, Hall & Oates' songs were filled with strong hooks and melodies that adhered to soul traditions without being a slave to them by incorporating elements of new wave." While much of their reputation is due to the sustained pop-chart run in the 1980s, they continue to record and tour, and remain respected by various artists for their ability to cross stylistic boundaries. They are best known for their six No. 1 hits on the Billboard Hot 100: "Rich Girl", "Kiss on My List", "Private Eyes", "I Can't Go for That (No Can Do)", "Maneater", and "Out of Touch", as well as many other songs which charted in the Top 40. In total, they had 34 chart hits on the US Billboard Hot 100, seven RIAA platinum albums, and six RIAA gold albums. while VH1 placed the duo as No. 99 on their list of the 100 greatest artists of all time. They were inducted into the Rock and Roll Hall of Fame in April 2014.